Marketing innovation is an important differentiator for E-commerce retailers in India. The real challenge for marketers in this category is to not only be visible (at the right places) but also show real return on every Rupee invested. Since everything needs to be linked back to results, campaign measurability is vital. Strategic Out-Of-Home advertising coupled with M-commerce and Smart-phone feature integrations are slowly gaining popularity with these sites for providing easy access to information and immersive digital experiences to their tech savvy target audience. 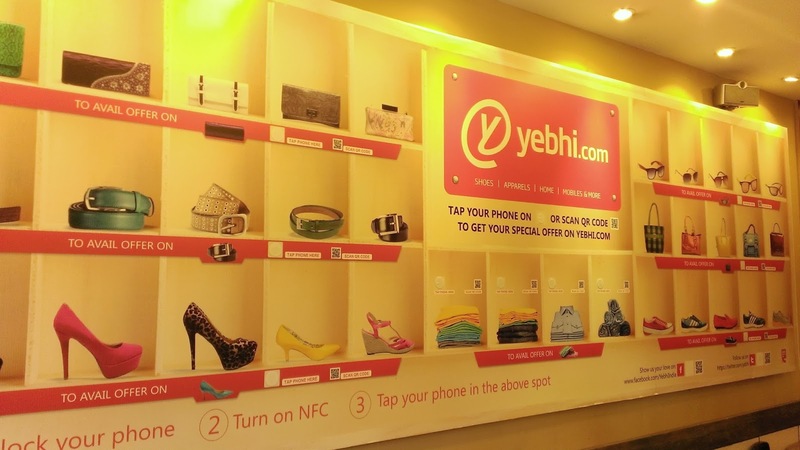 After HomeShop18 and DIAL, fashion and lifestyle shopping portal, Yebhi.com has introduced a Virtual Shopping Wall at 30 Café Coffee Day stores in Delhi and Bangalore. This huge billboard at a CCD in Cyber City Gurgaon (pictured above) that I chanced upon few days back, boasts of around 35 offers with NFC tags which lets visitors tap their phone on the wall or scan QR codes to browse through the range at Yebhi, check out offers and access Yebhi pages on Facebook & Twitter. This is a great way to reach the ‘young and affluent’ target audience in a set-up where they are relaxed, hanging out with friends or lounging alone and therefore more willing to check out something new. If not anything else, it’s great branding. The only downside is that the structure is static so new offers cannot be featured real-time and the top half of the banner is nearly inaccessible.